Alice & Shay began the search for their ideal wedding venue in Spain last year. They really had no idea what type of location or area they were looking for so decided to contact a wedding planner in Spain to get some help and advice on where to start with choosing the right wedding venue. Their trip over was packed, the Sunshine Weddings Spain team took them on a complimentary venue finding tour where they saw a number of areas along the coast in southern Spain. As soon as they arrived in Nerja, a beach side town around 30 minutes East of Malaga, they knew this was the place for them to have the wedding in Spain they had dreamt of for so long. 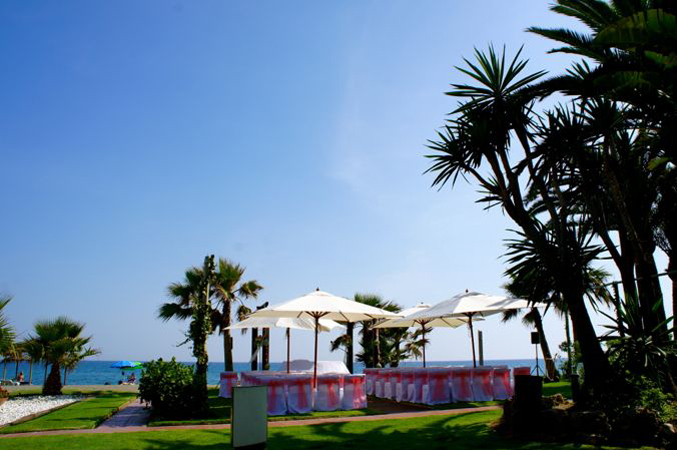 The beach side town setting, weather and easy access with cheap flights sealed their wedding location, and to take the stress away they made the decision to use the Sunshine Wedding Spain team as their wedding planners in Spain to organize their entire celebrations. Guests flew over from Ireland and joined the bride and groom, at the hotel they had chosen to stay, for the duration of their holiday, which was in the center of Nerja and where they could all enjoy the local amenities. Alice and Shay had chosen a surprise beach wedding venue in Spain. They had reserved a private grassed area over set next to the beach for their ceremony. The setting was beautiful the weather was gorgeous and the bride and groom took their vows overlooking the Mediterranean Sea, surrounded by 60 of their close friends and family. The bridal couple both had two sons of similar ages so this was a special day for them to celebrate and seal their family as one. To highlight the atmosphere they had a duo who played throughout the day with classical music to welcome the bride to her groom, followed by an uplifting selection of songs which the duo sang and played to during the reception and an hour of fun and dancing before the DJ took over and where the party carried on long into the night. Dinner was served in a covered area but open at the sides so guests could experience the sea views keeping the wedding party cool and for them to enjoy this beautiful beach wedding venue in Nerja Spain. Congratulations Alice and Shay and thanks for letting us be a part of your very special and fun day!